Mom, What's For Dinner? : Move over Nutella, there is a new healthy organic spread in town! Move over Nutella, there is a new healthy organic spread in town! I hear and see how much people love nutella every single day. I mean if you watch TV, I am sure you have seen the ads that suggest that Nutella is a healthful breakfast choice, but it turns out Nutella’s about as healthy as a twix bar. One woman was so appalled when she realized that two tablespoons of her go-to breakfast spread packed in 200 calories, 21 grams of sugar, and 11 grams of fat, that she took the company to court…and won. (In fact, if you bought a jar of Nutella between January 2008 and Feb 3, 2012, you’re entitled to a refund.) (source: ABC News). So please know that it is a DESSERT, not a breakfast! We need a dessert spread that is not full of garbage. An organic one! Enjoy Nocciolata any time of day. Try it in the morning on toast, or on a crusty bread for a delicious afternoon snack. 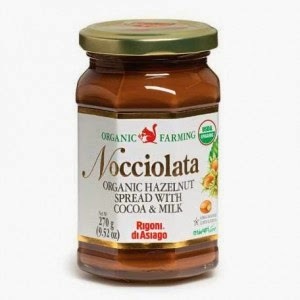 Nocciolata is the perfect special ingredient for cakes, crepes, cookies, muffins, and many more recipes. It's fantastic as a frosting or filling in all your baking inventions! No matter how you enjoy it, there are always new ways to love Nocciolata! Get yours here, or ask for it at your local grocer.